Read the useful travel tips, types of attractions, options of accommodation and more about Qutio, the capital of Ecuador to get ready for your trip. Quito is many things! It is the capital of Ecuador; sitting at 2800 m above sea level, it is one of the highest capitals in the world; it is the closest capital city to the equator; it is one of the best-preserved Spanish colonial cities in the world; and the whole city was designated as a World Heritage Site by UNESCO in 1978. With a population of over 2 million people, it is the second largest city in Ecuador after Guayaquil. Its origins go back 1000 years when tribes formed the Kingdom of Quito. This kingdom eventually became a part of the Incan Empire. The old part of Quito is located in the central district. There are two other districts: the southern part of Quito is a working-class neighbourhood made up of residential and industrial areas; and the northern section is the more modern part of the city, with a financial district, high-rise buildings, upscale residential neighbourhoods and shopping centers. Quito is also a city of education. There are dozens of universities, the oldest being the Universidad Central del Ecuador, which was founded in 1826. When this is beared in mind, it is not hard to understand the redundancy of the young population, which also contributes to the colorful aura of the city. Quito guarentees you have a wonderful trip; the number of attractions, places to see, things to eat and things to try out is limitless. All you have to do is choosing which one of these you'd like to try out. Your time in Quito will be one of the most exciting and hard to forget travel memories that you'd ever have. Quito is located on the slopes of the Pichincha volcano in the Andes Mountains in north-central Ecuador. How to get to Quito? The Quito Airport is the point of entry into Ecuador for most visitors. For many years, when the airport was located in downtown Quito, visitors were treated to a landing at one of the most dangerous airports in the world. As of 2013 a new airport opened about 18 km from downtown Quito. Located on a wide flat plateau east of the city, it is a much safer airport. The road between the airport and downtown Quito was built long before the new airport was planned, and so it is not equipped to handle the increased traffic. Very long travel times are not unusual. Taxis are available and there are buses that run between the city and areas near the airport, but not into the airport itself. Buses into the city from the outlying areas including the airport area terminate at the Rio Coca Bus Station, the main bus station. From here taxis are available, or you can simply walk across the street to the conveniently located city bus station. From here it is easy to navigate the bus system and get to most places within Quito. The first stop in Quito should be the Plaza Grande, or Independence Square, which is surrounded by fine examples of colonial architecture: the Carondelet Palace, which is the seat of Ecuador's government, the Archbishop's Palace, the Municipal Palace, and the Metropolitan Cathedral. There are many other beautiful churches in the old city, including the Church of San Francisco, the Church of El Sagrario, the Church of Santo Domingo, and the Church of La Compania de Jesus, with its exquisite gold-leaf interior. The other important church, the Basilica del Voto Nacional, is located about 1 km north of the Plaza Grande. Quito has more to offer than just churches and colonial buildings: it also has some wonderful museums like the Casa del Alabado with its pre-colonial art, the Museo de Arte Contemporaneas, the Museo de la Ciudad devoted to the history of the city, and the art museum at the Museo Nacional del Banco Central del Ecuador. There are many shopping opportunities in Quito. There are shopping centres like the Centro Comercial Quicentro, Centro Comercial El Jardin, and Centro Comercial Inaquito; small specialty boutiques like Ag (jewelry), Arte Sacra (crafts), Folklore Olga FIsch (crafts), Galeria Latina (handicrafts), and Maqui (panama hats); and art galleries such as Galeria Catasse, Galeria Mina ALvarez, MarsuArte, Posada de Artes Kingman, and Rosy Revelo. There is also a market of craft stalls called Mercado Artesanal La Mariscal and even a weekend art fair called Parque El Ejido Art Fair. Like many places around the world, Quito offers a variety of dining choices, from basic and inexpensive local fare to very high end and expensive restaurants. There are restaurants serving fish and seafood from the Pacific Ocean, as well as dishes from the Andes Mountains. Meals are often served with plantains, potatoes or rice, and a variety of fruits and fruit juices. Some popular dishes include churrasco, chaulafan, ceviche and cebichocho. Plaza El Quinde and La Floresta are the areas where restaurants are abundant. Quito has a shiny life night scene, however, also notorious for being not to safe around the clubs and bars late at night. That'd be wise to pre-plan your return to your hotel after you enjoy a few drinks. Most of the clubs and bars, as well as the pubs that have live music are located in New Town. 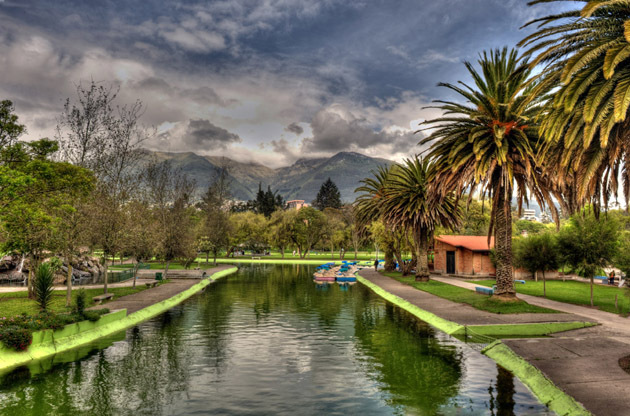 In addition to a walking tour of the old historic centre of Quito, there are two popular side trips that you may easily do while visiting the city. The first is a cable car ride called "Teleferico." There are easy trails at the top, and the views of the surrounding volcanoes are unforgettable. The second is a tour to Mitad del Mundo, or "The Middle of the World." This enormous monument built around 1980 supposedly stands on the equator just north of Quito. There had been a slight miscalculation when it was built, so just around the corner is the Intinan Solar Museum which also claims to sit on the equator. Whether they are accurate or not, both places are worth visiting. Quito hosts a large number of international events every year. Large scale congresses, conferences, symposiums, seminars, fairs and tradeshows gather a lot of important people in their field together and turn Quito into a hub for intellectual meetings and business. The quality of the hotels and high tech equipped venues also have a major role in Quito's becoming a top choice as an event city.